The following is taken from the book, The Great Organ of the Cathedral of St. John the Divine, A Plan for Restoration, 1992 out of print, by Paul A. Baumgarten. The Great Organ: One of five organs in the cathedral complex, it was completed in 1911 by Earnest M. Skinner, and enlarged and rebuilt in 1952 by G. Donald Harrison of The Aeolian Skinner Organ Company. The organ is a 4 manual and pedal, 7 division elector-pneumatic action pipe organ of 118 speaking stops, 141 ranks, 8035 pipes with Cymbelstern, Harp, chest preparations for 3 additional stops, and console preparation for Chimes. The Great Organ has several extraordinary features which immeasurably heighten its tonal effect and our musical enjoyment including the famous high-pressure State Trumpet at the West End, the magnificent high-pressure Solo Tubas, a battery of Bombard reeds, and remarkably effective 32' voices. The organ pipes are divided between two large spaces above the floor of the Choir on the north and south sides. The console is located in the gallery above the South Choir stall. The organist, invisible to the congregation, can see the choir and clergy directly or by means of mirrors and video cameras. The present day replacement value of this organ would be well over $8 million. It must be noted, however, that it would be impossible to replace this instrument today as many of the materials are no longer available and the skills and temperament that produced this work of art are not part of today's culture. In this sense, the organ is priceless. The Great Organ's history is as colorful and intriguing as the cathedral in which it is housed. It has seen many changes and upheavals, the biggest being the conversion of the cathedral from a Byzantine Romanesque architecture as designed by the first builders, Heins and LaFarge in 1892, to the Gothic structure it became under Ralph Cram in 1916. 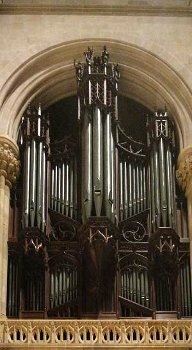 The money to build the Great Organ of the Cathedral of St. John the Divine was donated in 1904 by then Governor of New York State, Levi Parsons Morton. He donated a sum of $600,000 to cover the cost of the organ ($50,000), the Choir ($450,000), and the Altar ($100,000). Morton's contribution for the organ was intended as a memorial to his recently deceased daughter, Lena Morton. An agreement was signed on May 19, 1906 by Ernest M. Skinner and W. R. Huntington, Chairman of the Fabric Committee, to build the organ for $45,000. The instrument was to be "complete, in every detail, in the Cathedral of St. John the Divine, within six months from the time when the building shall have been made weather proof... and sufficient organ shall be in place for service purposes when the building shall be ready for worship." Five years elapsed before the structure was sufficiently complete to allow the installation of the organ to commence. The installation was completed in early 1911, and a dedication ceremony was held in April of that year. A stone plaque in the ambulatory, beside the door to the organ console, is inscribed "The organ is Dedicated to the Praise of the Blessed Trinity and in Loving Memory of Lena Kearny Morton, 1875-1904, by her Parents, Levi Parsons Morton and Anna Livingston Morton." Skinner titled the organ Opus-150. It is interesting to note that immediately after the organ was installed, a maintenance agreement was signed with the Skinner Organ Company which provided for weekly maintenance of the instrument and technicians to be on standby at regular and special services in case of emergencies. Until the fire of last year, this policy was still adhered to with Douglass Hunt being the organ's curator. By the late 1930's the second phase of construction was under way, and the Nave of the cathedral was nearly complete. The new nave would provide a completely new acoustical environment for the organ. Plans were made to finish the Chancel ceiling with limestone rib vaulting, which up to that time was unfinished Guastavino tile. Drawings were made by Cram's office indicating minor alterations to be made to the organ chambers. Services were to move to the completed Nave, and portions of the Great Organ were to be moved to the Nave as well.